So I worked out probably my biggest problem with Destiny’s Story. I had too much material. I had the brainstorm the other day to do another notebook. I’ve not done a physical notebook (binder) for any story since … oh about three or four back, honestly. Doing this helped me see what I had – and what I had was a lot. So I sat down with printed sheets, dividers, pens, and markers. Turns out I have enough material for three books. 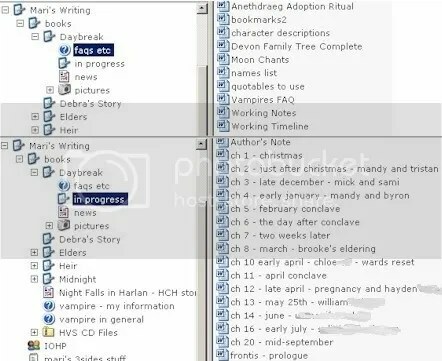 Since then, I’ve been working on breaking up what needs to go into which book, updating notes, separating sections, answering questions, setting up various pages and notes I need/use in OneNote. Kind of, in a way, starting this whole project from scratch. Yesterday, I printed off four pages of questions I need to answer. Today, I spent a bit of time answering them. Tomorrow, I need to get the timelines for all three books set up. After that – I should be ready to write again. Finally. Which is good because I have some of this material up for the WriteOnCon and need to get it all switched around and redone before the actual con starts next week! I also finished one editing project (remember the one with all the commas?) and got it turned in. I’ve got a piece to read before Thursday evening, to turn it back in to my critique group. And I still have one editing project in progress. Don’t assume young adults are some incomprehensible alien race (I see that on some forums). PLEASE don’t do fashion, tech, pop culture, etc. unless you KNOW what’s going on now. Don’t think you can write a $#%&&* book because it’s ‘just’ YA. The only ‘draft’ copy I’ve ever kept was the first completed copy of Midnight back in 2004. It’s in a sealed manuscript box on a shelf in my closet. I also save a document called “unused bits”. That’s where I stick stuff that I decide doesn’t need to be in the main story body. Sometimes these come in handy – a phrase or two might come back into the story somewhere else; or a whole scene (or paragraph or snippet) might come back in another story, reworked to fit. Once a document gets typed up, though, it’s subject to any and all kinds of reading, editing, hacking, you name it (because I never can just “leave it alone”). Once the story is finished, then the files get arranged in chronological order and printed out. This is when they get their first “heavy hand” line edits. Those edits get typed into the existing files. The the files get put into one document. All those individual files (except the “unused” files ones) get deleted. The full document, then, is my “official first draft” – even though it really isn’t; it’s probably draft twelve squillion and a half, but that’s the process that works for me. From this point forward, it’s the full document that’s going to be read by readers, editors, etc, etc. This is all probably about as clear as mud. My blog for May for Apex Blog is up. You can read it here: It Builds Character!